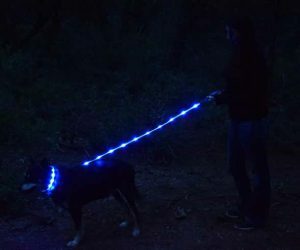 Most people have an estimation of the cost of a lighted led dog leash, but you need to stay aware that the cheaper ones have a problem with visibility. A good leash needs to be able to light all the way from the dog’s neck to your hand. This direct line makes it possible for an oncoming driver to see you and the dog should you happen to be crossing the road at night. A lot of us assume that as long as the dog is visible, then all is good. Of course, nothing could be further from the truth. A motorist might see the dog alright but fail to notice you behind it. In this scenario in case they swerve, you might find yourself in the direct line of danger. Always go for flashing lights as they are visible from a long way out. There are different types of batteries for lighted dog leashes. With some, you have the option to recharge over and over again for as long as the unit performs at an optimum level. There are others that can only be used once and will need to be thrown away after that. Your best bet will be on the batteries you can recharge as they are convenient and save on costs. When shopping for a leash, find one that has ‘flash’ settings. This mode allows you to save on power and maximize battery life as the piece is not technically on all the time. A good dog leash will last for any time period between 6 months and two years. It is hard to predict how long yours will last because it all depends on the use and dog type. Some dogs pull hard while others tend to be relaxed. Some chew on their leashes while others do not. You can guarantee yourself peace of mind and a great ROI by making sure to pick out the most durable leash on the shelves, even if you have to pay through the nose for it. At Yippr, we stock a large number of dog leashes, but the common denominator is that we make sure to give you the best there is. The available Yippr dog leashes have several LED settings, and the good thing is that they all have a USB port in case you want to charge the device with your computer. Yippr also has a premium rechargeable led dog collar that offers the same conveniences as the rechargeable leashes.